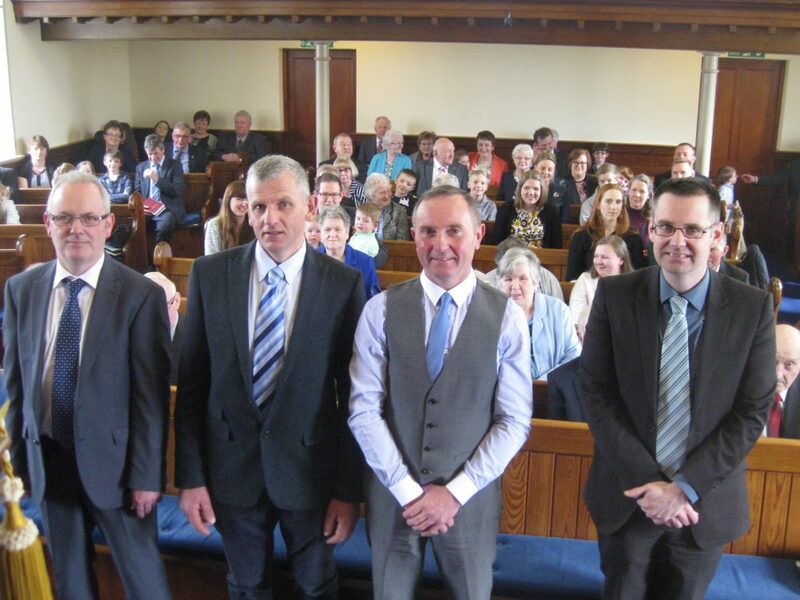 Lords Day, 23rd April 2017, was a memorable day in the life of Kilraughts Reformed Presbyterian Church as four men, namely Mr. William Hanna, Mr. Michael Kennedy, Mr. Harold Kerr, and Mr. Robert Pinkerton were ordained and installed to the role of ruling elder within the congregation during the morning worship. The members of the congregation welcomed friends and family of the elders elect to the congregation for the service where Rev David Fallows, the minister of Kilraughts RP Church addressed the new elders and the congregation as a whole from the words of Paul in Acts 20v28. Messer’s Hanna, Kennedy, Kerr and Pinkerton will serve alongside the existing six elders who themselves have given many years service within session. It is the prayer of the congregation that these men will be a blessing to those whom they serve and that they in turn will be blessed in their serving .